Ecosprinter | KLIniKA: another city is possible! KLIniKA: another city is possible! Klinika was established in the beginning of December when a group of activists occupied an old clinical center and decided to change it into something what we still miss in Praha. With a very nicely formulated project they wanted to build an independent social – cultural center based on autonomous principals. The autonomous centre could have the power to create from a devestated clinic a successful, publically beneficial project. Unfortunately, as usual, state authorities with fear and prejudices, dealt with it through no dialogue but with repression. 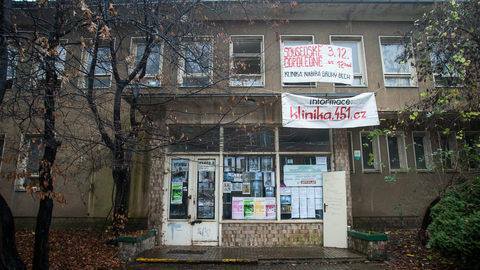 After 10 days Klinika was evicted by the riot police. Moreover, the facts which now we learn lead to the conclusion, that the police have got much more influence than we first expected. What happened with Klinika is nothing more than a clear testimony which states in what the real situation of the Czech institutions is. Which one is more powerful than the others and finally which one holds the executive power. Repressive forces have got more influence than they would have in a well deserved democratic society. This fall, we commemorated 25 years after the fall of the former regime which fell among others due to violation of civil and political rights and bore clear signs of an authoritarian regime, which former dissidents often and in my opinion very aptly, described as a bureaucratic dictatorship. The system, which without scruples their own apparatchiks and omnipresent State Security (StB – the political police in “communist” Czechoslovakia) interfering with the inalienable rights and freedoms of its own citizens’. And it’s all thanks to the strong, institutionally police apparatus that bullied anyone to whom this malevolence is pointed. My parents who spent hours at the Police station at Bartolomějská street (the headquarters of the StB) under police interrogation can tell you- right Mom? Next year, in the summer, it will commemorate 10 years the brutally suppression by the state power of CzechTek. The almost traditional summer Teknival, where the participants and the participants were beat up a blood riot just because they were “different”. All the applause of the political in the security elite of the state from the same country which is reported to have the values ​​of liberal democracy. Cultural diversity is not an obstacle to peace but a condition in a real liberal democracy. Anyone can tell you, yea dude? Now to Autumn 2014, the second decade of the 21st century. In Prague’s Žižkov, something was created that many of us have been waiting for years. What many of us know from abroad or at least been ready for. Something that in many places around the world, for a long time has worked without debate, proved its broad contribution here that it can be entirely subsumed under the term of “public interest”. I still remember the moment when I visited in Norwegian Trondheim the renowned Svartlamon and saw for myself that another city is really possible. Now it’s hard to convince me otherwise. The Autonomous Social Centre Klinika had ambition to be something more than only a squat. It could be the nucleus for our own small Žižkov’ “Svartlamon”. The project in just 10 days revived a building which was a dilapidated clinic on Jeseniova street and was turned into a thriving area filled with joy and hope. And mainly- purpose. It was not only the place itself, but also its immediate surroundings that felt gray boredom is not absolute, and that if it wants to, it can be a joint effort to make something unforgettable. What eventually happened is an uncomfortable finding that the state again called the cops and had power over all the efforts of people of the initiative and outside the clinic to vacate. No dialogue, just again and again- riot police. Democracy whether non-democracy, police state, bureaucratic dictatorship, authoritarianism … All this in our system still rots and prevents people to peacefully develop differently than the official propaganda dictates. The struggle continues! Follow the effort on the Internet and on Saturday in Prague at a local demonstration. Tagged Klinka, Prague, squat, Svartlamon, Zizkov. Bookmark the permalink.